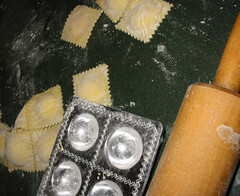 Nothing says Christmas to us like raviolis on Christmas Eve. Trish and I belted out about a hundred of these babies the day before Christmas Eve with a wild toddler bobbing about the kitchen and everything. Total mayhem, but it was worth it. We had these with some baked cod that set off the smoke detectors, oh well. Wouldn't be the holidays if it weren't a little crazy. Today, a standing rib roast (not done on the infamous Weber, sniff) and all the sides. Have a good food holiday all!